The mood was sour on Capitol Hill in June 2007. Powerful members of the Senate were humiliated when they were forced to withdraw a wildly unpopular immigration bill that would have provided de facto amnesty to illegal aliens. Talk show hosts frequently express opinions that rankle prominent politicians, and occasionally they even whip up inconvenient public outcries that torpedo deals cut in Congressional cloakrooms. But isn't talk radio in effect the national conversation about public policy? Don't our leaders trust us to accept responsibility for governing ourselves by choosing our own sources of information? Aren't radio talkers protected by freedom of speech and freedom of the press? Maybe so, but Constitutional principles won't prevent unscrupulous politicians from seeking a way to punish their political enemies. So how could the Senate deal with those troublesome talkers? A group of senators started speaking publicly about reviving the so-called Fairness Doctrine, an FCC regulation suspended by the Reagan administration in 1987. The Fairness Doctrine, first established in 1949, required broadcasters who expressed opinions about controversial issues to give air time to the other side. While its stated intent was to provide balance and increase the amount of opinion available to the public, in practice the Fairness Doctrine stifled free speech by intimidating broadcasters and driving up the cost of broadcasting editorials, and it served as a handy weapon against political opponents. On the heels of the June 2007 immigration controversy, a report appeared in Washington, D.C. that offered a pretext for restoring the Fairness Doctrine. Written by two liberal advocacy groups, the Center for American Progress and the Free Press, the June 21 paper The Structural Imbalance of Political Talk Radio concluded that commercial talk radio is heavily biased in favor of conservatives principally because major corporations, rather than local owners, women and minorities, own the radio stations. 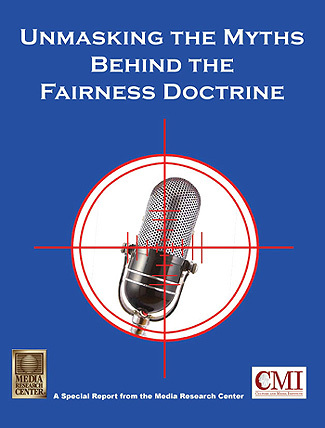 The CAP report was clearly designed to provide a rationale for bringing back the Fairness Doctrine. Are these arguments valid, or are they myths? We will test the scarcity argument by determining how many news sources are available to Americans, and identifying where Americans turn for their news. We will test the censorship argument by determining the availability of liberal-leaning and conservative-leaning talk show hosts and talk radio stations. We'll also place the argument about talk radio in the context of the media as a whole, by revealing the audience reach of the principal liberal-leaning and conservative-leaning sources in the five major news media: radio, broadcast television, cable television, newspapers and news magazines. While no single talker, radio station, newspaper or broadcast network is 100 percent liberal or conservative, almost every source leans distinctly in one direction or the other. Finally, we will test the public interest argument by reviewing the history of the Fairness Doctrine in practice. Does conservative talk radio really dominate the political landscape? That could be true only if talk radio is the prevailing source of news and information in the United States, a doubtful proposition on its face. Given that the liberal party took control of Congress and many state governments in 2006, the notion that conservative talk show hosts are calling the shots in the United States seems dubious. The original justification for the Fairness Doctrine, which became public policy in 1949, was the 'scarcity' argument. The idea was that the airwaves are public property, and the number of wavelengths available on the public airwaves was limited, so the number of radio stations was also limited. Therefore, the government was obligated to make sure broadcasters provided the public with both sides of controversial issues. Were Americans really deprived of information in 1949? Given that 2,881 radio stations and 98 television stations existed at the time, 9 this argument was questionable from the beginning. With the advent of the Internet, the number of news sources available to every individual with a modem has soared into the hundreds of thousands. So how many Americans have modems? According to the Project for Excellence in Journalism's annual State of the News Media report for 2008, 75 percent of American adults are using the Internet as of December 2007, up from 70 percent in December 2006.13 And how many people with modems are turning to the Net for news? According to comScore Networks, a global Internet information provider, 'half of all U.S. Internet users visited news sites' during the month of June 2006.14 The Internet has profoundly expanded the availability of news media. Still, the biggest news players on the Internet are the traditional news providers. According to several sources, the Internet's most popular news destinations are the Web sites of newspapers, television stations, and radio stations, or portals that lead to the sites of these news organizations.15,16, 17 Therefore, we will focus on television, radio, newspapers, and news magazines, rather than Internet political sites and blogs. Americans can choose from thousands of news sources available around the clock. While the Fairness Doctrine did not apply to non-broadcast media listed here, and presumably would not in the future, our purpose is to establish that an unprecedented number of news and opinion sources are available to the public. Broadcast television offers seven national news shows per weekday, plus local news shows. The three major commercial networks, ABC, CBS and NBC, each broadcast morning and evening news shows, and PBS airs an evening news show. ABC, NBC, CBS and Fox also have affiliated stations throughout the nation broadcasting one or more local evening news shows. Not even counting TV news magazines and overnight and weekend shows, the typical American can choose from 12 to 15 broadcast television news shows every day. Cable television offers 10 national news and public affairs channels available all day long. The typical American cable subscriber can choose from four major cable news and opinion networks, Fox News, CNN, CNN Headline News and MSNBC, which provide virtually continuous news and opinion programming. CNBC, Fox Business Network and Bloomberg offer business news. In addition, C-SPAN broadcasts three channels with separate schedules of live or recorded news events. 1,437 daily newspapers were published in America in 2006.18 Three major weekly news magazines are available throughout the nation. With All These Choices, Where Do Americans Turn for News? According to the National Cultural Values Survey conducted for CMI in December 2006, most Americans say they rely on either cable or broadcast television as their principal source of news and information. Talk radio, while popular, is not a principal source of news. Is Talk Radio Really Running America? In sum, traditional news sources - newspapers, news magazines and broadcast television - provide the typical American dozens of news broadcasts and publications to choose from every day. Cable networks and radio news/talk stations provide news and opinion programming around the clock. The Internet pushes the number of news sources available every day well into the thousands. Even the most badly addicted news junkie could not possibly watch, read or listen to every source of news available to the typical American. Only a small fraction of Americans say they count on talk radio as their primary source of news, so the notion that talk radio is running America is difficult to justify. The scarcity myth simply doesn't hold water. Nobody can possibly justify re-imposing the Fairness Doctrine on the grounds that Americans have limited access to news, or because conservative talk radio, in consequence, is running the country. Are Americans being deprived of access to liberal points of view? Any examination of the talk radio universe will reveal that liberal voices are very well represented on the airwaves. Moreover, talk radio is only one slice of the media pie. Within the 'elite media,' the major television and cable networks, the leading news magazines, the most circulated newspapers, and most popular news/talk radio programming, liberal news and opinion sources reach a far greater audience than conservative sources. Have Liberals Been Squeezed Out of Talk Radio? One linchpin in the effort to restore the Fairness Doctrine is the June 2007 joint report by the Center for American Progress and the Free Press, The Structural Imbalance of Political Talk Radio. The CAP report analyzes 'political talk radio programming on the 257 news/talk stations owned by the five largest commercial station owners,' and concludes that 91 percent of their programming is conservative, and nine percent 'progressive.' In an additional analysis of all news/talk stations in the top 10 markets, the CAP report finds that 76 percent of the programming is conservative and 24 percent is progressive. The CAP report suffers from a number of structural flaws of its own. For example, its principal study reviews only the five biggest radio station owners, who together own only 18.8 percent of the 1,366 commercial news/talk stations counted by Inside Radio. Also, the report overlooks Air America, a 55-station commercial network created deliberately to spread liberal ideas, and at least 800 noncommercial public radio stations that broadcast liberal news/talk programming. The CAP report fails completely to document any effort by radio broadcasting companies to 'squeeze out' liberal opinion. Readers of the CAP report will search in vain for a single example of a broadcaster canceling a liberal talk show or shutting down a liberal station on ideological grounds. If liberals were being squeezed out of talk radio, then liberal talkers should be difficult to find on the radio dial, especially in the AM commercial wavelengths. The evidence says otherwise. 1. Commercial Talk: Anybody who wants to hear liberal talk radio can find it on the airwaves or over the Internet. Air America's Ed Schultz, America's most popular liberal talker, appears on more than 100 talk stations, including stations in nine of the top 10 markets, according to his Web site.27 In addition to broadcasting over the airwaves, 26 of Air America's 55 stations stream over the Internet, making commercial liberal talk radio available 24/7 to anybody with a modem. 2. Noncommercial Talk: Liberal programming is available throughout the nation on the 'public' airwaves. The CAP report's greatest flaw is ignoring noncommercial talk radio. Public radio offers consistently liberal news/talk programming produced by four separate networks. The biggest single player in noncommercial issues-oriented radio broadcasting is the government-supported National Public Radio network. A second publicly supported network, far-left Pacifica Radio, owns five noncommercial stations, and is broadcast on more than 100 affiliated stations.32 All five Pacifica stations and at least 300 NPR stations stream over the Internet, making their programming available to the entire nation all day, every day. While the biggest voices in radio lean conservative, liberal-leaning news sources in broadcast television, cable television, newspapers and news magazines reach far more people than conservative-leaning sources. No major conservative-leaning broadcast television network exists, so conservative-leaning broadcast audience reach is 0. Audience reach statistics for the morning and evening news programs are not 'additive' in a strict statistical sense because the audiences overlap. However, audiences overlap for newspapers, news magazines, talk radio and cable news as well. For simplicity's sake, we combine the morning and evening numbers in this paper. 'Wait a minute!' you cry. Am I really saying the three liberal-leaning cable news networks, CNN, CNN Headline News and MSNBC, together draw three times as many people as the single conservative-leaning network, Fox News Channel? Doesn't Fox have nine of the 10 highest rated shows? Cable TV ratings are based on the average number of viewers watching at any given moment during the daytime or evening. Fox News Channel viewers tend to stay with Fox shows for longer periods of time, while the liberal networks' viewers are more likely to watch for a just few minutes at a time, so Fox programs have more eyes glued to the screen at any given moment and Fox shows generate higher ratings. Far more sets of eyes, however, visit the liberal cable networks. Cable ratings are not unimportant, but measuring average audience at any given moment doesn't tell us what we want to know. Because we're assessing the audience reach of liberal and conservative news sources, we're more interested in the total number of viewers who watch each network. Cable TV measures total audience on a monthly basis - and the monthly 'cumes' tell a different story from the averages. As a group, the liberal-leaning cable networks reach about three times more viewers per month than conservative-leaning Fox News. Circulation numbers, which emphasize subscriptions, may significantly understate the true newspaper audience. Readership, an attempt to count the actual number of people who read the newspapers either in hard copy form or on line, may double or treble circulation. Readership figures are far less exact, however, so we use circulation figures instead. No solid, publicly available numbers exist for talk radio audience reach. Only Talkers Magazine compiles a list of the top commercial talk shows by size of audience, and many people in the radio industry passionately dispute Talkers' numbers and rankings. For example, Talkers estimates Rush Limbaugh's audience at 14 million per week, while the corporation behind Limbaugh's show, Premiere Radio Networks, asserts that Limbaugh reaches 20 million. 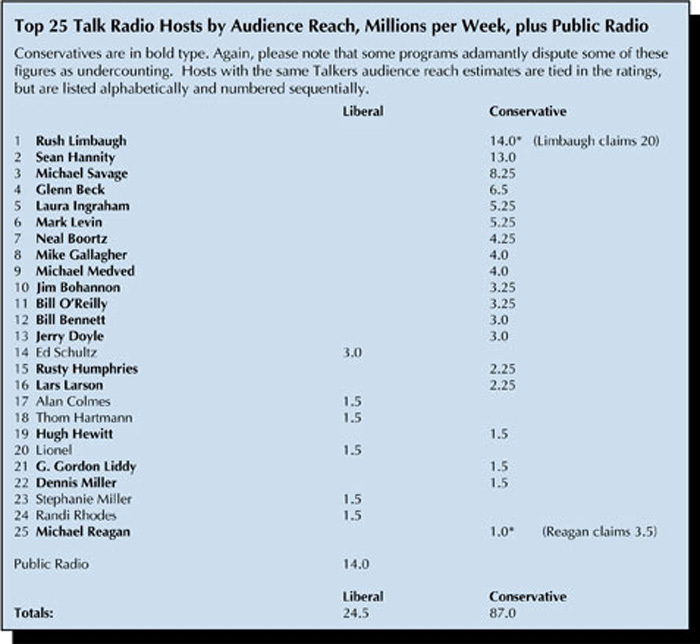 CMI attempted to contact each of the issues-oriented talk shows on Talkers' list of top radio audiences, and found some hosts who accept their Talkers estimate and others who say they're undercounted. One company actually said one of its shows is overcounted. For the sake of argument we will use Talkers' data, which fall somewhere in the middle of the possible range of audience figures. No complete picture of talk radio's audience reach can ignore the noncommercial side of the equation-public radio. According to the Project for Excellence in Journalism (PEJ), the news/talk shows of the four major public radio networks collectively reach 14 million people per week, an audience that rivals the biggest commercial talk shows. The noncommercial public radio networks, unfortunately, do not provide comprehensive audience reach statistics for their shows. Therefore, we are considering public radio as a whole alongside our list of the top 25 talk show hosts. Even factoring in public radio, conservative dominance of news/talk radio is clear: the leading conservative and libertarian-leaning sources reach about 3.6 times more people per week than the leading liberal-leaning sources. The weekly news magazine medium is dominated by the Big Three: Time, Newsweek and U.S. News and World Report. Like the biggest medium, broadcast television, the news world's smallest major medium is composed exclusively of liberal-leaning sources. Are Americans Really Deprived of Liberal News and Opinion? After examining the audience reach of major liberal- and conservative-leaning news media sources, the 'Squeezed Out' myth - that liberal voices are being squeezed out of radio, so Americans aren't hearing one side of the debate - doesn't hold water. News/talk radio reaches about 110 million people per week, and the leading conservative-leaning sources lead in audience reach by a ratio of 3.6 to 1. Talk radio, however, is not the only, or even the biggest, news medium. Liberal-leaning news and opinion sources have no conservative rivals in the biggest medium, broadcast television, which reaches about 42 million people per day. 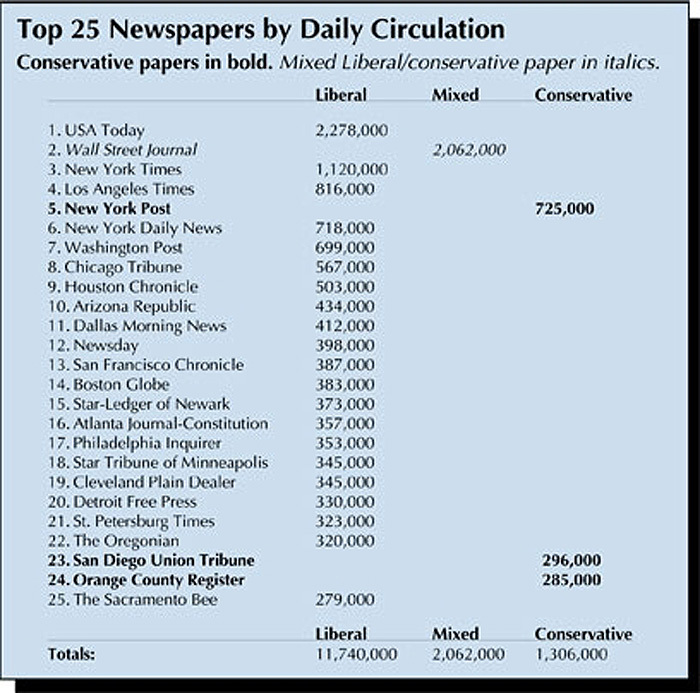 Liberal-leaning sources dominate the circulation of the leading newspapers, about 13 million per day, by a ratio of 9 to 1. News magazines have a circulation of about 9 million people per week, and all of the big three news magazines lean liberal. 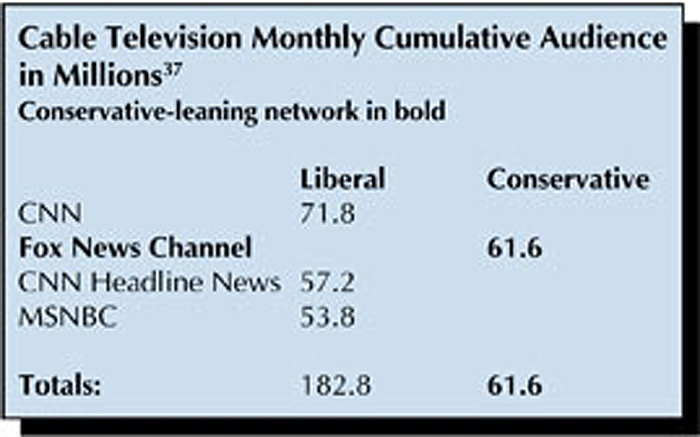 Cable television reaches about 244 million people per month, and liberal-leaning sources dominate cable television audience reach by a ratio of 3 to 1. 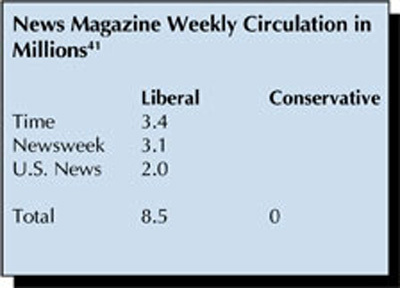 Liberal-leaning news and opinion sources dominate four of the five major information media. Though we cannot precisely compare total audience reach because the numbers are calculated for some media by million per day, others by millions per week, and one by millions per month, we can confidently assert that liberal-leaning news and opinion sources reach a far greater audience than conservative-leaning sources. At first blush the Fairness Doctrine seems very sensible, even obvious. Who wouldn't want broadcasters to provide both sides of controversial issues? Wouldn't the public benefit from hearing even more opinions? It's no wonder many broadcasters apparently were intimidated by the Fairness Doctrine, given the ugly history of politically inspired infringement on broadcasters' freedom of speech when the Fairness Doctrine was in force. The Spectator quotes a second 'Democrat leadership aide' saying Pelosi has targeted Rush Limbaugh and the Salem Radio Network, and that Ohio Democratic Rep. Dennis Kucinich's Government Reform committee staff has begun to investigate Salem. ''They are identifying senior employees, their political activities and their political giving,' says a Government Reform committee staffer. 'Salem is a big target, but the big one is going to be Limbaugh. We know we can't shut him up, but we want to make life a bit more difficult for him.'' Pelosi and other Democratic leaders have since denied having such a plan. America does not need the so-called Fairness Doctrine. Americans enjoy overwhelming, unprecedented access to news and opinion from a practically unlimited number of sources representing every conceivable value system and school of thought. While no individual news medium is perfectly balanced in the variety of opinions it provides to the public, the sheer volume of information provided by the news media, increased exponentially by the Internet, guarantees that anybody can find liberal or conservative takes on public policy issues at any time of day or night. We do not need government to dictate to radio broadcasters, or anybody else, that they must counter their own opinions by subsidizing the presentation of opinions they disbelieve. Thomas Jefferson said 'To compel a man to subsidize with his taxes the propagation of ideas which he disbelieves and abhors is sinful and tyrannical.' Government compulsion of speech is a form of taxation for commercial broadcasters, and for all of us it's a threat to one of our most cherished civil liberties, freedom of speech. America enjoys such an embarrassment of riches in news and information that Fairness Doctrine advocates on Capitol Hill have opened their motives to question. Is it really conceivable that they are trying to make Americans better informed? Or is it more likely that they want to bring the monster back from the grave in order to hush Rush and his colleagues in talk radio, as Presidents Kennedy and Johnson did to political opponents? Don't they believe the American people, who dictate what succeeds in the market, can be trusted to choose their own information sources? These politicians need a refresher course in the Constitution, in particular the First Amendment, and in basic democratic principles such as respecting the right of others to oppose you. As Voltaire said, 'I do not agree with what you have to say, but I'll defend to the death your right to say it.' Greater dedication to free speech would be welcome on Capitol Hill.